Rental Properties Legal Entity Choices – Sole Proprietorship, LLC, or Multiple Entities? As an investor in rental property, you have several important priorities. Delight your tenants so they stay, refer friends, and pay on time. Protect your personal and business assets. Grow according to your goals. Creating a formal entity is very important to shield you from personal liability for actions taken by the business. Operating any business as a sole proprietorship is generally not advised by attorneys as you are exposing yourself to personal liability if something happens in the business. This is not an actual entity, but rather the “default” that happens when you just start doing business. Some people start this way, but then have to transfer that property into a different entity. (See section 4.08, Transfer a Property you own into your Company in the full guide ($)). This is very common among real estate investors and management companies. This is the structure assumed in the sample company files in our guide. Laws differ from state to state, and LandlordAccounting.com does not provide legal advice. Consult your attorney. Nolo is also a great place to start reading legal books about setting up your entity. S-Corps are still a popular option, although in recent years LLC’s have become much more popular. C-Corps are rarely advisable due to their inefficient tax characteristics compared to other entities. You may consult with your attorney and resolve to create several entities. Some may hold assets but not be exposed to liability, and others do the management (liability activities), but do not own the assets. This is sometimes referred to as the “Hot entity / Cold entity split.” The hot one has all the risk, but no substantial assets. One QuickBooks company file is designed to handle bookkeeping for one company. If you are using a multiple entity structure, you have a choice: one file, or several files. If one file, you could use classes for each entity and sub-classes for each property or owner. Some companies chose to create an account for each entity, and duplicate sub- accounts (like Rent Income and Maintenance Expense) under every entity’s account. Different files could also be used for each entity. Intuit would want you to create separate files for each entity, because their tax line mappings are designed for one file to map to one company. 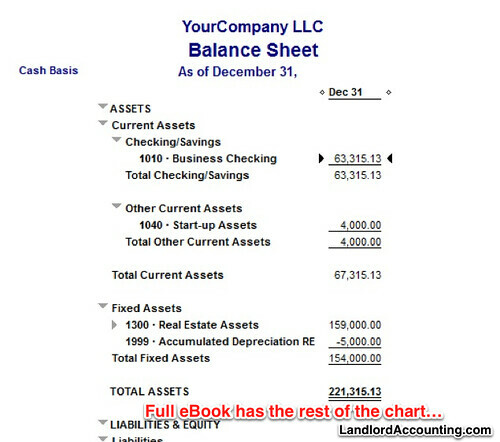 And, when creating Balance Sheet or P&L reports they default to include all accounts. If you go this route, it will take some effort to and open and close and enter transactions in each company file. But, reporting will be straightforward. (And, recent year’s QuickBooks support opening several company files at once). See also other posts and discussions on multiple entities. Q&A: How to deduct a tenant’s rent who also does work for you? Today’s question comes from a creative landlord who wants to credit a tenant for work performed. (If you like this, consider buying our full training). I’m a landlord, and sometimes I make an arrangement with a tenant to get a rent deduction in exchange for work done. How do I record this in QuickBooks? Example: John Smith, a tenant of yours, also shovels snow for your apartment building. For this, he gets a $100 deduction on his rent during the winter months. Select the Vendor from the Pay to the Order of drop-down. Enter the expenses and/or items for which you are writing the check. On the next blank line, select the Accounts Receivable (A/R) account from the Account drop-down menu. 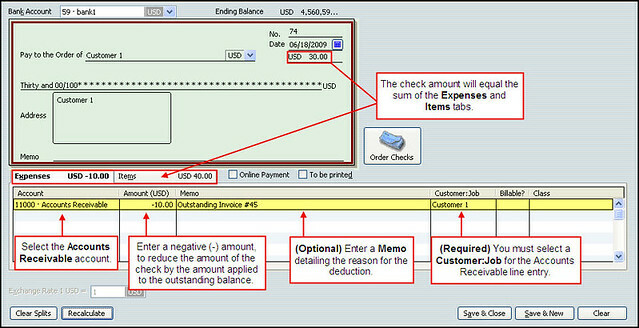 Enter a negative (-) amount equal to what you wish to deduct for the outstanding accounts receivable balance. Here, $-100.00. On the same line, select the customer:job “Smith, John” from the Customer:Job drop-down menu. Enter a memo into the Memo field on this line. This memo is an optional explanation of why money is being deducted from the check. Once all of the information has been added to the check, click the Recalculate button. This is located in the bottom-left corner of the Write Checks window. Now, click Save & Close. Save the check and a credit will be added to the customer’s A/R account. Then apply this credit to the outstanding customer balance. If you print the check, the deduction will now reflect on the check stub; along with the memo explaining the deduction.